I always like to start my visit in a new city with a walking tour. This will give me an overview of all there is to see, an introduction to the history of the particular city, and a sense of orientation of where everything is. 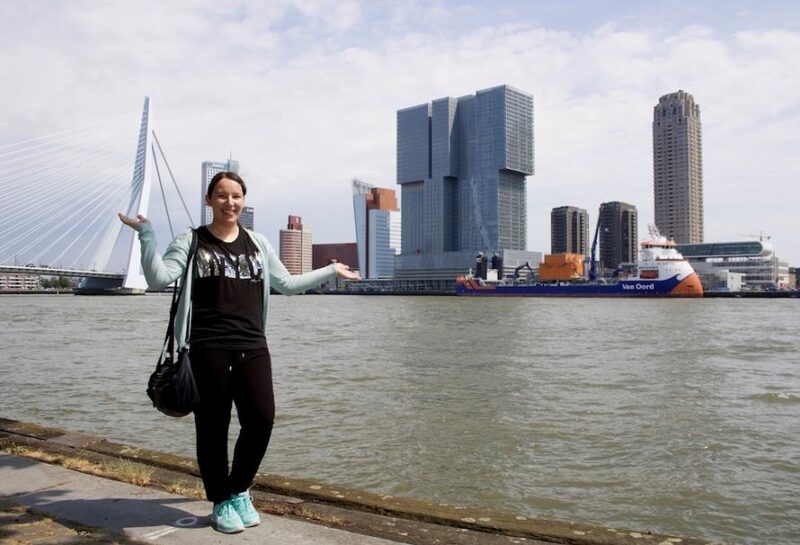 The perfect introduction to Rotterdam was my walking tour with Hassan and Ferah from Rotterdam Pages. These statues might look bored, but I can ensure you that a Rotterdam walking tour will definitely be anything but boring! The start of the Rotterdam walking tour will be at the city's ultra‐modern central train station. Together with the Erasmus Bridge, the funny shaped Cube Houses are Rotterdam's most famous symbols and photo spots. For just 3 Euros entry, you can see one of these houses from the inside. And when you book a room or dorm at the Stayokay Hostel, you can even stay in a cube house yourself. If you're not afraid of heights and always wanted to get your hands on church bells, climb the 326 steps to the top of the Church of St. Lawrence ("Laurenskerk" in Dutch). Built between 1449 and 1525, the Church and Bell Tower is Rotterdam’s only surviving late Gothic style building. Entry to climb the tower is by guided tour only. Once you've arrived at the top, you can enjoy some of the best views of Rotterdam. From the Church of St. Lawrence it's just a five minute walk to the "Markthal" – Rotterdam's famous indoor food market. 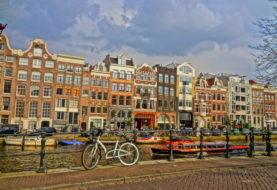 Enjoy a Dutch staple here, such as a yummy Stroopwafel or Dutch‐style Fries with mayonnaise. And while you're here, don't forget to look up to the ceiling. The huge food‐inspired mural is one of the most impressive indoor murals worldwide. Rainy day? This is the perfect time to check out Rotterdam's various museums. For the master pieces of the old (Dutch) masters, check out the Museum Boijmans Van Beuningen located in Rotterdam's "Museumpark". Also located in the Museumpark are Kunsthal Rotterdam and the Natural History Museum Rotterdam. For those who would like to learn more about Rotterdam's history, I can recommend a visit to the Museum Rotterdam and the Maritime Museum Rotterdam. In the basement of the Rotterdam Tourist Information (Coolsingel 114), you will also find a small exhibition about the history of the city that is free of charge. And for modern photo art, the Nederlands Fotomuseum always has an exciting photo exhibition on. Formerly the city's red‐light district, the Witte de Whitstraat is now the perfect street to eat, drink or start your Rotterdam night out. There is also lots of cool street art to marvel at. The water is never far away in the city that owns Europe's largest port! So why not discover Rotterdam from the water by taking a quick water taxi ride or a slower scenic boat ride with the Spido sightseeing boat? For those who would like to combine their sightseeing with a party or dinner cruise, the old‐world paddle steamer ‘De Majesteit’ is the perfect choice. Dating from 1926, the paddle steamer was originally a cruise ship that sailed from Cologne, Germany to various countries along the river Rhine. During the fifties, the ship even served as a film location, when the film G.I. Blues (1960) with Elvis Presley was shot here. Today, ‘De Majesteit’ is the largest sailing paddle steamer in Europe. Among the public parties that you can join throughout the year are the so‐called "Showboat Party", "Mississippi Steamboat Night" or "Rotterdam Hot!". In addition, the boat can also be rented for private functions. On board of the Rotterdam paddle steamer from 1926. A great destination for a Rotterdam water taxi ride is the Hotel New York, which is located on an "island" opposite the city centre. Together with Bremerhaven and Hamburg in Germany, the harbour of Rotterdam was one of the main ports for European emigrants who left for a better life overseas, such as depicted in the film The Immigrant (2013). So if you have Dutch ancestors, they would have most likely left from the port of Rotterdam and more precisely from the Hotel New York, which back then was the head office of the Holland‐America Line. Today, the art nouveau building of the Hotel New York is a hotel and restaurant. Erasmus of Rotterdam was a 15th century humanist and the namesake of the "Erasmus exchange student program", which financially supports young Europeans to study at other universities within Europe. Erasmus himself was a great example for European mobility. After growing up in Rotterdam and nearby Gouda, Erasmus travelled all over the continent and studied in Cambridge, England, Paris, France, and Basel, Switzerland. Of course, the city now has a statue of its famous inhabitant. This statue is located in front of the St. Lawrence Church and you will pass by here on the walking tour with Rotterdam Pages. In Rotterdam, Erasmus was also the namesake for the city's most famous bridge, which should definitely not be missed on any visit to Rotterdam. Thanks to its many renowned universities, such as the "Erasmus University", Rotterdam is home to a large student crowd from near and far. This is also why there is a very young vibe in the city and many cool nightclubs to discover. Club Vibes, for example, hosts some legendary Rotterdam parties and is located right next to Café Stalles, a good‐priced restaurant and bar with delicious pizza. 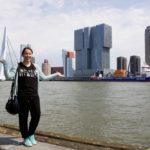 Disclaimer: I visited Rotterdam while the city was hosting the Traverse Travel Blogger Conference. Thus, I received a complimentary ticket to climbing the St. Lawrence Tower and the walking tour with Rotterdam Pages. We were also given a tour on the paddle steamer boat ‘De Majesteit’. As always, I have provided my honest and unbiased opinion about my experiences in Rotterdam. This blog post includes affiliate links to Booking.com. If you click on any of these links and make a booking, I will receive a small affiliate fee, which I will use towards running my site. You're welcome! 🙂 Such a cool idea! Hi! I'm Sonja from Germany. 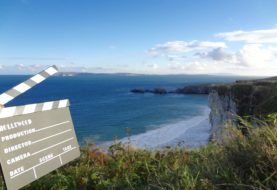 I'm a full‐time Freelance Translator and Travel Journalist on a part‐time mission to discover the world through movies. Become a film fan on Facebook! Join the journey on Instagram! © Sonja Irani 2019. All rights reserved.